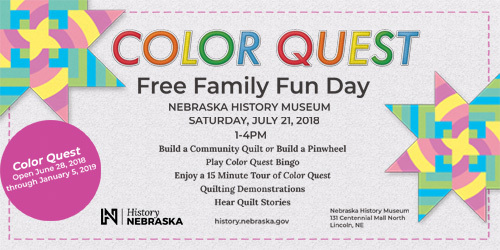 Join us at the Nebraska History Museum for another free day of family fun with History Nebraska! Take part in a community quilt or create your very own pinwheel. Enjoy a scavenger hunt through the museum's Color Quest exhibit. Learn the secrets of quilting with a live demonstration in the lobby.